New Delhi, January 21: Army Chief General Bipin Rawat has stressed on incorporating Artificial Intelligence (AI) and big data computing into the Armed forces' system. He was addressing the valedictory function of the National Conference on 'Self Reliance in Defence Manufacturing' in Hyderabad on Sunday. General Rawat said, future wars are going to be fought in the cyber domain and it is important to start understanding the relevance of AI and Big Data computing and how to incorporate it into the defence system. He said the Indian Armed forces have to be prepared whether it was defence of borders, combating proxy wars, terrorism, insurgencies or other internal security disturbances. The Army Chief also said, the defence forces needed equipment that were capable of deep viewing adversaries' territories. "Apart from guns and rifles, we will see lot of non-contact warfare happening. Future wars are going to be fought in cyber domain," he said. It is important to start understanding the relevance of AI and Big Data computing and how to incorporate this into the defence system, he said. "Our adversary on the northern border (China) is spending huge amounts of money on Artificial Intelligence and cyber warfare. We cannot be left behind. It is time for us to also focus on AI and on Big Data Analytics rather than just keeping it confined to mere definitions," the army chief said. He said the defence forces needed equipment that were capable of deep viewing adversaries' territories. "This equipment could either be based on satellites... which fortunately we have some but are not adequate to keep continuous surveillance and other means like drones, unarmed vehicles, remotely piloted vehicles.. this is the need of the hour." There is a need for a battle field management system, which would enable the commander to incorporate and integrate all the information that was available and hence, technology becomes very important, he added. Noting that the Centre was opening two Defence industrial corridors in Uttar Pradesh and Tamil Nadu, he said: "Rather than becoming an import industry we should become export oriented based on case-to-case because we do not want our technology to fall into our adversaries' hands." He said there are some countries willing to share technology with India and the industry needs to partner with some of the foreign Original Equipment Manufacturers and see how best they incorporate technology and "we get manufacturing within our country." 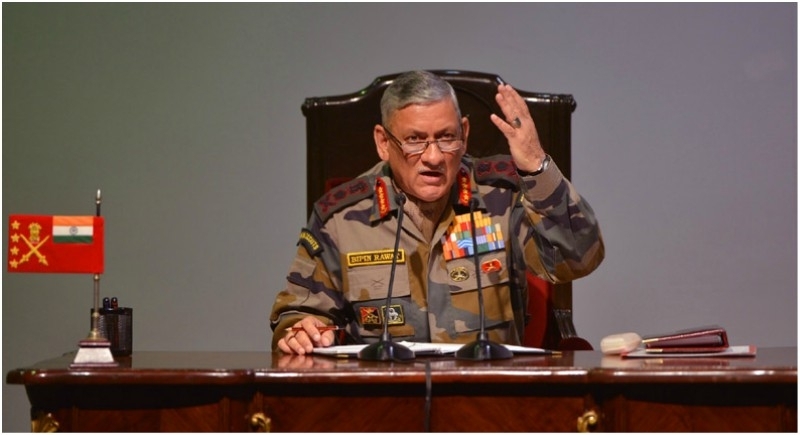 Emphasising the importance of preparedness for future dimensions of warfare, General Rawat said the Indian armed forces have to be prepared whether it was defence of borders, combating proxy wars, terrorism, insurgencies or other internal security disturbances. "We have to understand that we have disputed land borders on our northern frontiers, partially unsettled borders on our western sector. So, we don't see peace on the horizon anywhere in the near future." The armed forces have to be ever prepared by imbibing new technologies, keeping pace with the advancements in warfare, he said.